Hanoi (VNA) - Musical project Look at the World which aims to raise funds for the programme Thien Nhan and Friends will be organised at Hanoi Opera House on July 20. Launched twice a year, the project includes a variety of art forms like choir performances and art exhibitionins. 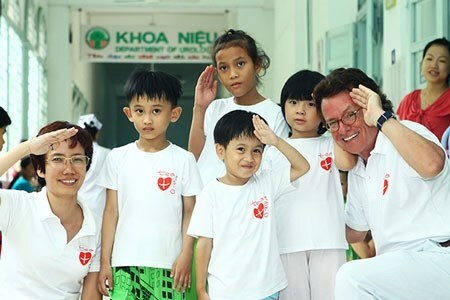 Organised by the Vietnam Volunteer Information Resource Centre (VVIRC) and the Sol Art Centre, the program raises money to provide children with surgery. According to Vu Minh Ly, the general director of the VVIRC, all the money acquired through selling tickets and via donations from organisations and individuals will contribute to free surgeries for 25 children with organ deficiencies. Over 100 small children will also benefit from the project by receiving free medical check-ups and consultations. Ly revealed that the organisers expect to raise a total of 1.3 billion VND (59,000 USD) to cover the free surgeries and medical check-ups for disadvantaged children. “Look at the World will breathe new life into volunteer campaigns. Not only raising funds, the arts are also very powerful in spreading humanitarian messages. I believe that music will be a wonderful bridge connecting kind hearts together, and volunteering in arts and culture will continue to flourish. Through their performances, the artists are expected to inspire the community, especially the youth, with a strong passion for volunteering,” Ly said. “We also believe that when the unfortunate children have the chance to get treatment, they will find their own hopes and aspirations and therefore, have their own dreams,” he added. The Thien Nhan and Friends Programme, which is part of the Asia Injury Prevention Foundation, was established to help Thien Nhan, a three-day-old infant abandoned in a deserted garden in central Vietnam, who had lost one leg and his private parts. He was adopted by journalist Tran Mai Anh, who has been by his side through multiple operations in the past nine years to help him lead a normal life.